A South African High Court has ordered that all cultivation, possession and personal use of cannabis on private property be immediately permitted. This post from Cannabis News World reports the ruling of cannabis prohibition in South Africa as unconstitutional. The Western Cape High Court has just ruled that Cannabis prohibition in South Africa is “unconstitutional”, and that adults have the right to use, grow or possess cannabis in the privacy of their homes. 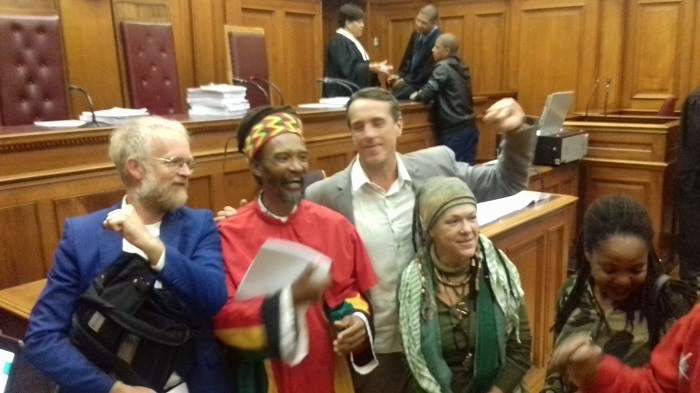 This was today’s verdict of the Jeremy Acton, leader of The Dagga Party, and Ras Gareth Prince’s multiple year long constitutional court case. All three judges of the Cape Town High Court unanimously declared the laws regarding Cannabis to be unconstitutional and ruled that the South African government had 24 months to amend these laws in favour of legalisation. The court ordered that all cultivation, possession and personal use on private property be immediately permitted. You can read the full 66 page ruling here. This is a huge victory for the South African cannabis culture, and hopefully paves the way for an almost certain victory in the Dagga Couple’s case later this year. Can I still get arrested for weed in South Africa? Yes, you probably can. The judges decided that the right to personally use, grow or possess dagga in the privacy of one’s home can be used as a “defence to a charge”. You can’t be charged without being arrested. Jenny Evans from News24 states that: “The order does not specify whether the defence must be presented in court, or at the point of arrest, saying only “a charge”. What this means is that ultimately you won’t go to jail for growing at home for personal use, if you can prove it. Whether or not police will focus on other crimes remains to be seen. What is clear is that the ruling is not a free for all, but a great step towards some form of legalisation. The details of a legal distribution and retail framework were not ruled on in this judgement. This essentially means that while personal use and growing is now legally permitted, the selling of cannabis products is not and thus the current laws regarding cannabis fall somewhere between decriminalisation and legalisation. It’s still unclear what will happen with citizens who were previously arrested on cannabis related charges. The state still might try to appeal this ruling. The next step is that parliament needs to within the next 2 years formulate detailed rules and policies to formally deal with a legal cannabis market. Parliament is in the process of obtaining the judgment to study exactly what it says. If the two laws mentioned have been found to be unconstitutional, then the Constitutional Court would have to confirm the judgment before Parliament can act. The state could also appeal the judgment.